There have been at least a dozen truly outstanding baseball movies produced since the Great Depression. KILL THE UMPIRE isn't one of them -- not even close. 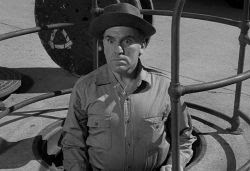 However, this rather silly, over-the-top comedy starring the always-delightful William Bendix is great fun to watch. Originally released in 1950, the tone is set at the very beginning when "Three Blind Mice" plays beneath the opening credits. Clearly this baseball film will be more in line with Stengel's "Amazin' Mets" than Steinbrenner's "Bronx Bombers." It's more Walt Dropo than Joe DiMaggio. More Marvelous Marv than Mantle & Maris. As for the plot, such as it is, we find Bendix portraying an ex-major league ballplayer who remains addicted to baseball. Regardless of his employment situation he simply can't let a game go by without skipping work to watch and, more importantly, to roundly heckle the umpires who he sees as representing "the lowest a man can get." Hey, a bleacher bum is entitled to his opinion, isn't he? 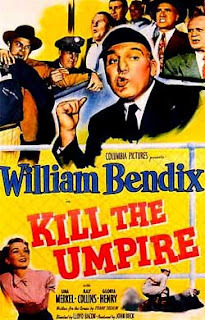 After being fired from yet another job, Bendix is about to lose both his wife and his family when his father-in-law suggests he think about becoming an umpire. After all, doesn't it make sense to try to find a way to make a living where one so very much wants to be, day-in and day-out? 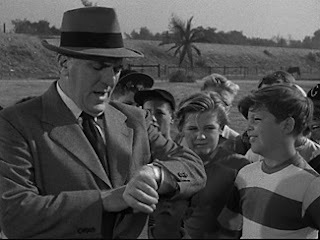 Reluctantly, Bendix enrolls in a school for wanna-be umpires run by William Frawley. "How can I be an umpire?" he declares. "I have perfect vision!" A series of wildly humorous attempts at getting thrown out of umpire school sets the stage for even wackier antics later, including an outrageously undercranked chase scene that makes the typical Keystone Cops caper look like Slo Mo Drabowsky in pursuit of a Dodger Dog. It is safe to assume that the assortment of highly entertaining, almost-cartoon like visual gags in KILL THE UMPIRE is the result of Screenwriter Frank Tashlin, who had just moved to features after a long and successful career as a director for various Looney Toon characters including Porky Pig, Bugs Bunny and Elmer Fudd. Hi-jinks abound, but there is a nice moral or two and a vitally important reminder that "there's no place in baseball for people who aren't honest." This was true over 55 years ago and it certainly remains true today. Which brings us to Barry Bonds -- "What a revoltin' development he is!" interestingly enough, i forced myself to watch this "foul ball" just yesterday. I gave up umpiring youth baseball because there were too many clowns like the bendix characature squatting behind home plate. If there ever was a reason for beverage alcohol at the ball park, this screwball may just be it. I'll have to check it out, since I love baseball and like seeing old Wm. Bendix movies, even though I can't see him without always thinking about Chester A. and Peg.